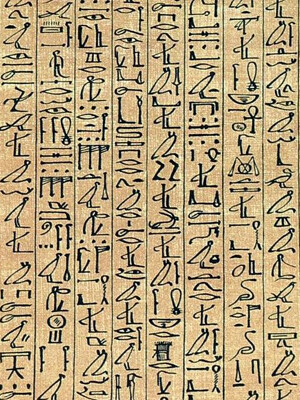 Pyramid Text – Circa 2400 b.c. Book of the Dead – circa 1500 b.c. Egyptian mythology contains the belief system of the ancient Egyptians, their religion, culture and traditions all included in this complex system of beliefs and rituals. It is polytheistic and centers on the Egyptians interaction with the many deities to gain the favor of the gods. Ancient Egyptians left behind many monuments and scripts to trace back much of its history. The earliest recovered evidence for ancient Egyptian culture and belief reveals a timeline beginning circa 3000 b.c. Previous to this was probably the beginning or origin of the time when a small group migrated to the area, and began to build up Egypt into the great dynasty or kingdom that it eventually became. There is evidence of this pre-dynasty period that shows even animals where ritualistically buried, suggesting a belief in the afterlife as early as this timeframe. As Egypt developed, each city took on its own patron god, these smaller communities would conquer and absorb each other, taking each god and adding it to their mythological collection, resulting in the complex pantheon we find today. Some of the most theological texts have come from the pyramids, they are known as the pyramid texts, and they give details concerning the gods of ancient Egypt. These texts give the origin of the gods, and concepts of the afterlife and contain many other ancient traditions. These are possible the oldest known religious texts in the world, as they date back to the old kingdom of Egypt. The Pyramid texts focused mostly on spiritual and celestial world elements. Written in hieroglyphs or hieratic script on papyrus, there is no specified canon of this book, as different religious sects commission their own versions of the texts. Also known as the “book of emerging forth into the light.” This is the ancient funeral text used by the Egyptians, full of magic spells to assist a dead persons journey through the underworld (Duat), and to the afterlife. The book of the dead included many of the pyramid and coffin texts from earlier times, which were typically painted onto the rooms or objects previously. Beginning circa 2500 b.c. dating to the beginning of the old kingdom, the book of the dead had been developed from traditions and developing funeral rites. Various pictographs and hieroglyphs where written on the tombs of pharaohs and deceased Egyptians, which was believed to help them find their way or protect them in the afterlife. Circa 1700 b.c. in Thebes, the first book was developed and contained some of the newer spells. The Book of the Dead became widespread not only for the royal families but for other officials as well. As time moved forward it was transferred onto cheaper scrolls for common folk to have a copy. the Pharaoh, or King of Egypt, was believed to be a descendant of the gods, and was relied upon to make that connection between the people and the gods through ritualistic practice, for blessings and to maintain order in not only their society but throughout the entire world. The people believed they could also individually appeal to the gods through prayer or acts of magic. A big part of the Egyptians belief system was the effort and practice they put into their preparation for the afterlife. They believed humans possessed Ka, or a life-force which left the body at the point of death. In life food and water was the sustenance of the KA, so in death it was believed the same must be necessary for the Ka to survive. Each person has a Ba, which is a set of characteristics unique to that person, this aspect of the person remained in the body after death. Egyptian burial rituals where intended to release the Ba so it would roam freely to join the Ka, and live on as the Akh. Egyptians believed the Ba would return to the body each night to receive new life before emerging in the morning as the Akh. Egyptians believed in a paradise afterlife that would be granted after avoiding the dangers of the spirit world (Duat), and undergoing a final judgment by the gods called the weighting of the heart. the actions of the person while alive would be judged worth or not. If they where worthy, their Ka and Ba would be united as Akh and the dead would be allowed to live in the paradise underworld of Osiris. The Akh could also, after its judgment, travel in the world of the living and affect things magically. The Egyptians developed many accounts of creation, each differing in the event they describe. Different communities probably accredit their own patron god with the creation of the world. However, the people did not see their different views as contradictor but rather many different facets of one complete story. One of the most common stories is that the world formed from the waters of chaos that surrounded it. This established Maat, the origin of life. A fragment describes 8 gods being the representation of the water itself, known as the Ogdoad. Their actions gave rise to the sun (represented by the god Ra), whose birth forms a space of light and dryness within dark waters. The sun then rises over the first mound of dry land. 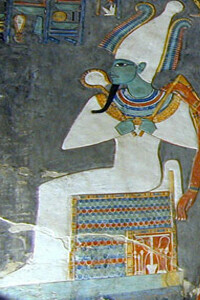 Dating back to the old kingdom, Atum is the god closely related to the sun and primeval mound. He then creates all the elements of the world and produces other gods, a total of nine deities. Another perspective given in the Coffin Text describes the creation of the world as a concept developed in the mind of the creator god. Heka, or magic, links everything in the divine realm to the physical realm, and is the connection between the creator original concept and how its physical realization. The creation stories have very little focus on the creation of human, or a place for them to dwell, but focuses mostly on the establishment of cosmic order. Humans are formed in the creation stories either as the tears of Ra, shed in a moment of weakness, which shows the sorrows and flaws of humanity. Other accounts state humans where formed out of clay by the god Khnum. Egyptians believed that sometime after the creation of the world, Ra dwelt on earth as king of gods and humans, in a golden age (paradise) of the world. Egyptians continually sought out to restore this paradise condition to the earth. Over time, as Ra grew old, humans plotted against him and try to release the world of his rule. Over time and many battles, he grows weary and returns to the sky, beginning his daily orbit through the sky as the sun. This begins humanities origin of death, warfare, and destruction against one another. One of the most elaborate Egyptian myths is the Osiris myth, and is the most widespread of all Egyptian myths. Osiris who is associated with kingship and fertility is killed by his brother Set and is torn to pieced and scatters throughout Egypt. Osiris sister wife, Isis, finds her husband and brings all the pieces of his body back together, practicing the funeral rites reflected in the Egyptian embalming rituals. He is revived long enough to conceive with her Horus, their son. Set become king during this time. Horus is hidden from Set whom seeks to kill the child. When Horus is grown, he challenges Set for kingship which causes great conflict, one in which it is said that Set tears out one of the eyes of Horus, which is later restored. Since Horus is the sky god, this is supposed to explain why the moon is dimmer then the sun, to reflect the torn eye during his battle with Set. Later, Horus is able to fully revive his father Osiris who is given new life in the realm of the death (duat), which he becomes ruler over. This relationship between Osiris as king of the dead and Horus, king of the living, is supposed to symbolize every pharaoh with his predecessor. 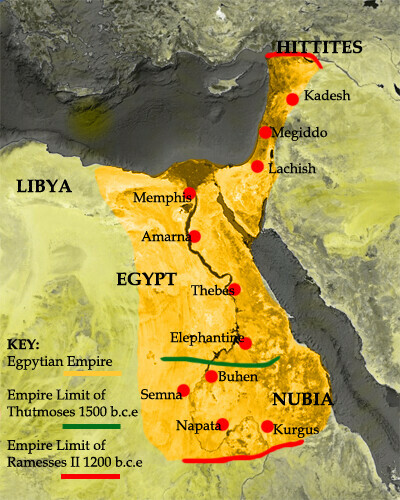 Following their rule, is the supposed beginnings of the lineage of the kings of Egypt. Various Egyptian texts give details about their beliefs in the sun god Ra. Ra (the sun god) moves accost the sky to bring light to the earth, he is strongest at noon. At sunset, Ra loses his strength and releases the other gods (the stars) that he swallows up each sunrise, known as the stars. This explains why we can see the stars at night but not in t he day. 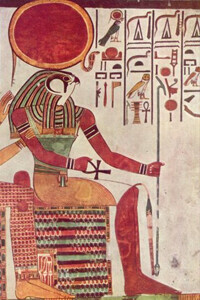 At sunset, Ra passes through the horizon (Akhet), the door to the underworld, or to the spirit world (Duat). Technically this would be viewed as the suns (Ra’s) death, and the mysterious power of the Egyptians belief in the spirit world that both gods and the undead can be renewed by the power therein which is the power of creation. The main event in his journey is when he meets and merges with Osiris into a single being. This is synonymous with Egyptians idea of time as a repeating pattern, united with Osiris regenerative power, Ra is able to complete his journey through the spirit world and is reborn at dawn in which he swallows and absorbs the power of the other gods (stars). In this revitalized state, Ra is depicted as the scarab beetle god Khepri, the symbol of rebirth. The coffin text and the book of the dead allude to an end of the universe in which all creation, after countless cycles of renewal, is destined to end, or rather, revert back to its primordial state in which only Osiris and the creator god Atum will exist. Specific details about the event are not portrayed, However this is a possibility that the disintegration of the universe can be avoided somehow and the potential exists for a new creation to arise in the same manner as the old one did. The architecture and structures of the ancient Egypt where very advanced. Since the beginning of Egyptian history, they had temples in every town to honor the deceased Pharaohs and to dedicate to their cities patron god(s). During the Old and Middle Kingdom eras, the Egyptian temples became elaborate and permanent structure made of cut stones. Many of these elaborate temples and pyramids still exist today. Specific areas indicate that the Egyptians worshipped specific animals, probably the animals that represented their patron gods. The people would even mummify certain animals in their rituals as an offering to the god, many times, a god that animal represented. Millions of mummified birds, cats, dogs and other animals have been found, buried at temples to honor their deities. Consulting oracles was a common practice for the Egyptians. They would consult oracles to ask the gods for knowledge, makings legal or government decisions, and asking for common guidance. This was performed in a number of ways, such as casting lots, watching the behavior of cult animals, or consulting statues and getting a message from a priest. Egyptians believed that the preservation of the body was essential for the survival of the soul in the spirit world .Egyptians practices elaborate mummification rituals to dissect a person body before it was placed in the coffin. Living relatives would write letters to their deceased loved one believing they could still influence the land of the living, just as their gods could. Tombs often contained a variety of items, such as statues of the person’s body so the soul would have something to use incase the body was damaged. Egyptians believed the deceased had to do work in the afterlife, so they would be buried with clothing and objects for everyday use, amulets and other magical objects for spiritual protection. Heka in Egyptian is magic, and they defined it as the ability to make things happen by indirect means, as interpreted by Egyptologist James Peter Allen (born 1945) of Brown University. Heka was believed to be the force that created the universe and which the gods used to do their will. Humans could use it, and every ritual was considered in itself magic, usually employed to overcome negative effects or harm. Priests where highly trained in the magical texted that the temple libraries contained and even the common people made use of it in their professions such as doctors, charmers and amulet makers.